A record crowd of just under 500 people attended the annual Beatty Memorial Lecture on Thursday, Oct. 16 with Dr. Karl Deisseroth of Stanford University. Dr. Deisseroth is a practicing psychiatrist and the researcher behind two revolutionary tools for studying the brain: optogenetics, a technique that uses light to control neurons, and CLARITY, a revolutionary method of making brain tissue transparent to observe neural connections and activity. A record crowd of just under 500 people attended the annual Beatty Memorial Lecture on Thursday, Oct. 16 with Dr. Karl Deisseroth of Stanford University. Dr. Deisseroth is a practicing psychiatrist and the researcher behind two revolutionary tools for studying the brain: optogenetics, a technique that uses light to control neurons; and CLARITY, a revolutionary method of making brain tissue transparent to observe neural connections and activity. The Deisseroth lab is committed to solving the mysteries of psychiatric disease, and has employed optogenetics and CLARITY to control and examine the brain’s complex circuitry as has never been done before. 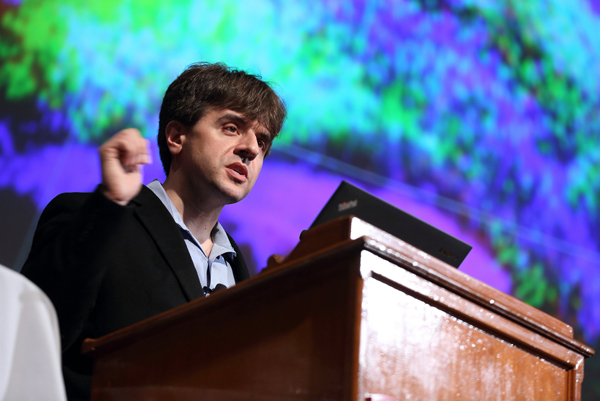 Deisseroth’s ‘star-power’ among neuroscience communities worldwide was confirmed at McGill. Many attendees at the lecture, which included a contingent of McGill’s homecoming crowd, jostled for front-row seats. Following the lecture, Peter Shizgal, Professor of Psychology at Concordia University demonstrated to Dr. Deisseroth that CLARITY is being employed here in Montreal, revealing a mouse brain that had been made transparent using the Clarity technique.